I felt that there was not a lot of respect for people waiting in line. There was a lot of stress. There were a lot of concerns about scarcity. Volunteers would be like, “Oh, she doesn’t need that much stuff.” You know, “People are lying to get more stuff and hoard it,” which is upsetting to see, especially because in the beginning, there were more donations than we could have ever given away. But pretty quickly sort of all these internal politics and— maybe what I would think of as fear of people who are poor or fear of people who need stuff, you know? That was all coming out and being expressed in ways that weren’t great. Despite the psychiatric community’s efforts to stabilize the concept of hoarding into a specific medical condition, it continues to circulate as an ensemble of heterogeneous elements loosely linked around reality TV shows, news items, and normative practices of material “purging,” collecting, and storage. In popular discourse , hoarding is often perceived as a behavior learned from a life of deprivation, a pathological addiction to material objects that exceeds their practical value. It is often tied to notions of disorder, compulsion, filth, and social isolation. 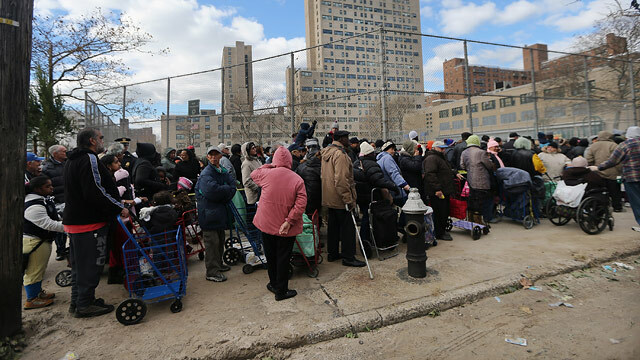 While the colloquial and mass media use of the term “hoarding” in the moments before Hurricane Sandy made landfall in New York City often described acceptable, or at least expected, disaster preparation behaviours, a more telling discourse emerged in the immediate aftermath of the storm from relief distribution hubs that collected and freely distributed food, clothing, and other material goods to those in need. In these cases, the concept of “hoarding” highlighted the differences–and politics–between equitable and equal distributions of goods. Bureaucratic red tape left NYCHA residents without power or water longer than many of their nearby neighbors in private housing. Moreover, to qualify for NYC Public Housing, residents have to be of a lower socioeconomic class, a status that increases their likelihood of vulnerability to disaster to begin with (Cutter et al 2009; Keck & Sakdapolrak 2013; Morello-Frosch et al 2009). These are reasons Occupy Sandy, which organized many of the relief hubs, focused on NYCHA residents. This brings us to the issue of equitable versus equal allocations of aid. 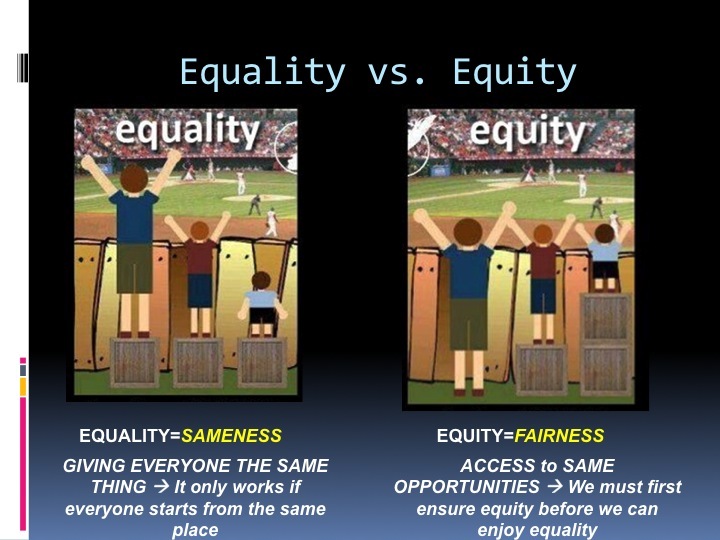 The terms equity and equality are used in many different ways but here, equality refers to fair exchange, where each individual or group receives the same quantity of goods; equity is about fair or just allocation, where greater needs receive greater attention and resources with the goal of bringing everyone to similar levels of vulnerability and resilience. The even distribution of risk over groups in a population is called dispersive equity (Fishburn and Sarin 1991). The goal of equitable disaster recovery is to bring everyone out of different crises into a shared recovery. Yet, the people in line complaining to the hub volunteer above desired equality over equity, and equity was branded as hoarding (Note tat in practice, everyone usually received what they asked for so long as supplies lasted, and they often did). Post-Sandy, there have been several analysis of uneven distributions of aid that privilege homeowners over renters, and big business and development over community needs. Ironically, sociologist Charles Tilly called this “opportunity hoarding,” which occurs when “members of a categorically bounded network acquire access to a resource that is valuable, renewable, subject to monopoly, supportive of network activities and enhanced by the network’s modus operandi, network members regularly hoard their access to the resource, creating beliefs and practices that sustain their control.” That is, the conditions for vulnerability to future disasters is the result of current hoarding by New York City’s elite. Thus, equitable recovery overall, as opposed to mirco-equity in food lines and distribution hubs, must address systemic causes of vulnerability in social, political, and economic domains. Cutter, S. L., Emrich, C. T., Webb, J. J., & Morath, D. (2009). Social vulnerability to climate variability hazards: A review of the literature. Final report to Oxfam America. (Vol. 5). Keck, M., & Sakdapolrak, P. (2013). “What is social resilience? Lessons learned and ways forward.” Erdkunde, 67(1), 5-19. Lepselter, S. (2011). “The disorder of things: Hoarding narratives in popular media.” Anthropological Quarterly, 84(4), 919-947. Morello-Frosch, R., Pastor, M., Sadd, J., & Shonkoff, S. B. (2009). The Climate Gap: Inequalities in how climate change hurts Americans and how to close the gap. Tilly, C. (1998). Work under capitalism. Boulder, CO: Westview Press. Max Liboiron is a co-founder of the Superstorm Research Lab, a mutual aid collective researching the effects of Hurricane Sandy on New York City and surrounding areas. This entry was posted in Activism, Consumption, Difference: Class, Race, Gender, Disaster, Justice (EJ) and tagged disaster preparation, disaster recovery, disaster relief, equity, equity versus equality, hoarding, hurricane sandy. Bookmark the permalink.